This workshop is the 101 of handmade paper! 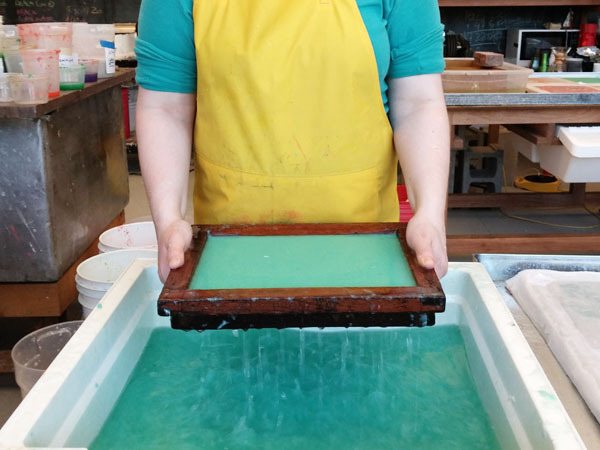 Journey through the process of papermaking from raw materials to hand pulled sheets of paper. This class is a combination of our beginner level – Deckle Box Paper and Introduction to Western Paper. Students will learn traditional European style sheet forming with fibres such as cotton, abaca (Manila Hemp) and Ontario hemp. We will explore the differences of pulling with a traditional laid mold and a woven mold. Techniques such as laminating, shaped sheets and inclusions will also be introduced, with opportunity for participants to bring in their own found material to experiment with. Basic Nepalese style deckle box is covered as well – a high walled mold and deckle, placed in a container of water allowing the pulp to suspend while pulp is dropped and mixed in. This allows individual pulls of different coloured pulp, mixes of different fibres and/or found materials to be part of the final sheet. Students will leave this course with 40-50 hand-pulled custom sheets of paper and enough knowledge to continue exploring paper at our intermediate level.